I swear that there is no better way to take out your frustration then by doing demolition, and that's exactly how I spent this past Friday. We had two projects to tackle over the weekend, and we successfully accomplished both. 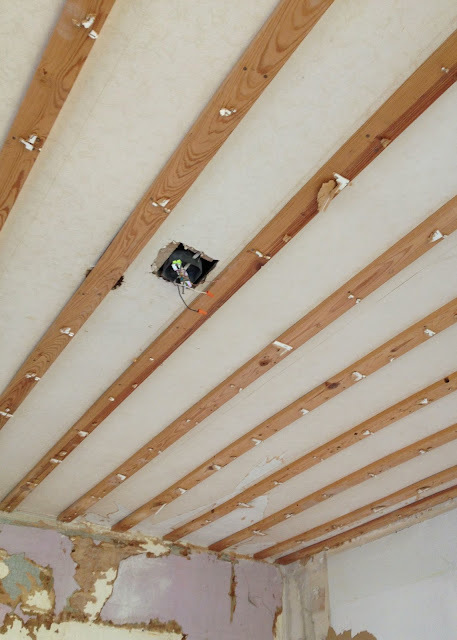 Back in September, I shared with you my "Prepping for a Project" post; which discussed how I was finally going to tackle the ceiling in my bedroom. The dumpster was waiting to be filled, and after about a half an hour, those paperboard tiles were GONE. Can I tell you, after waiting seven years, it was like the heavens opened up and angels started singing. 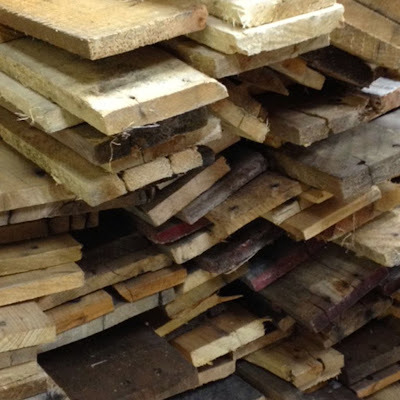 After crafting a plan and taking measurements, we prepped the pile of pallet wood, organizing them into new stacks of similar widths. It took a little while before we got the hang of it; but soon enough we were cruising along. My Dad manned the nail gun, while I was responsible for cutting the lengths we would need. We installed about 12 rows of the pallet wood on the ceiling, before we decided to switch gears and install the new light and fan, realizing that once the sun went down we would be screwed otherwise. This is where it got interesting. You might ask yourself why I am showing you an old metal pie pan. Well, anyone doing DIY work knows that things don't always go as planned, and when you add a 130-year old house into the mix, things can get even crazier. I like to think that I'm a "glass half full" kind of girl, so to solve a problem, we just got creative. 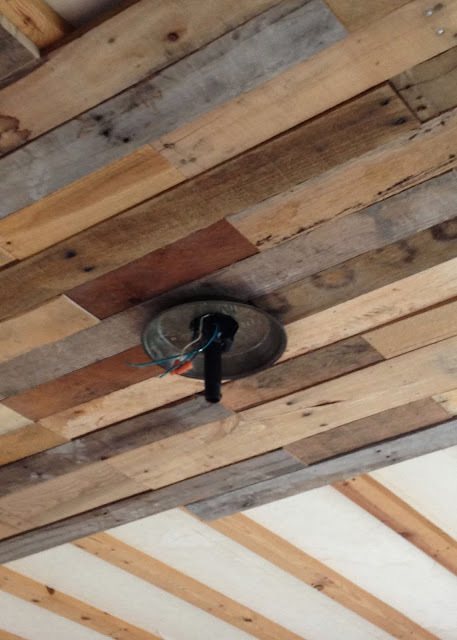 I mean seriously, wasn't that pie pan made to be used on the salvaged pallet wood ceiling? 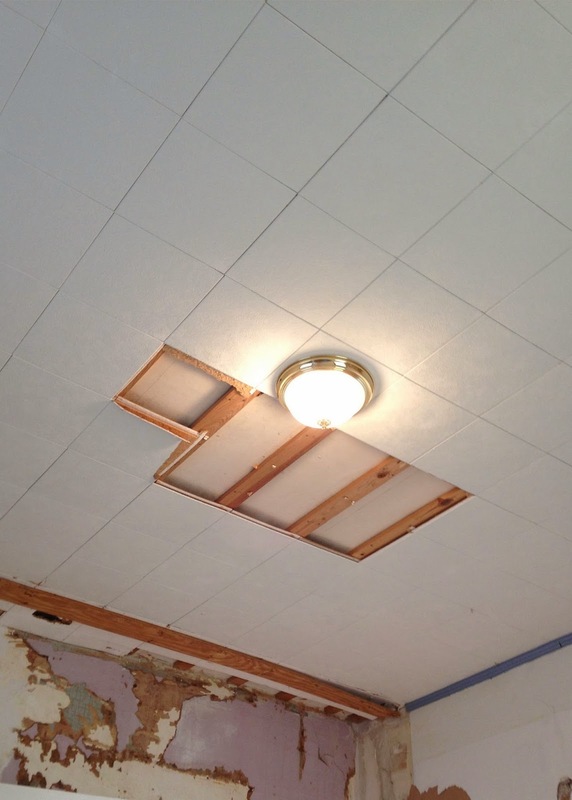 After the fan was installed, the ceiling went together fairly smoothly. Our only concern was would we have enough salvaged pallet wood to cover the 13ft x 14ft room? We knew how much square-footage we would need; but in the pile, we came across pieces which were cracked beyond use or too short. The table saw was a big help in the end and when all was said and done, we had just enough to finish. I am particularly proud of this ceiling and while my bedroom is far from being finished, it is a lot further along then it was three days ago. Wow, this is so cool! Can't wait to see this reno progress! O M G. Love it. Holy Cow, that's AWESOME! And how ingenious to use the pie pan. Can't wait to see what else you do! Oh, I LOVE this!!! Pat yourself on the back! 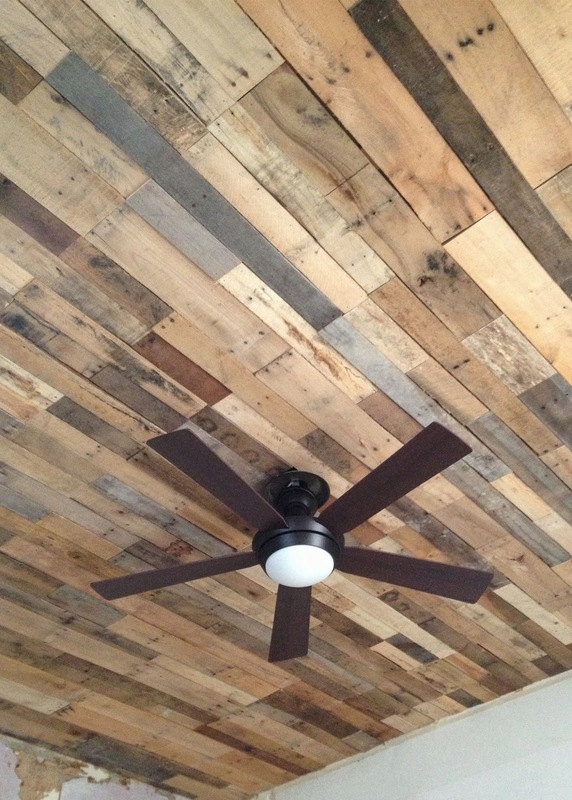 Your pallet wood ceiling looks amazing! It would be lovely to wake up to that every morning. Great work, missy! 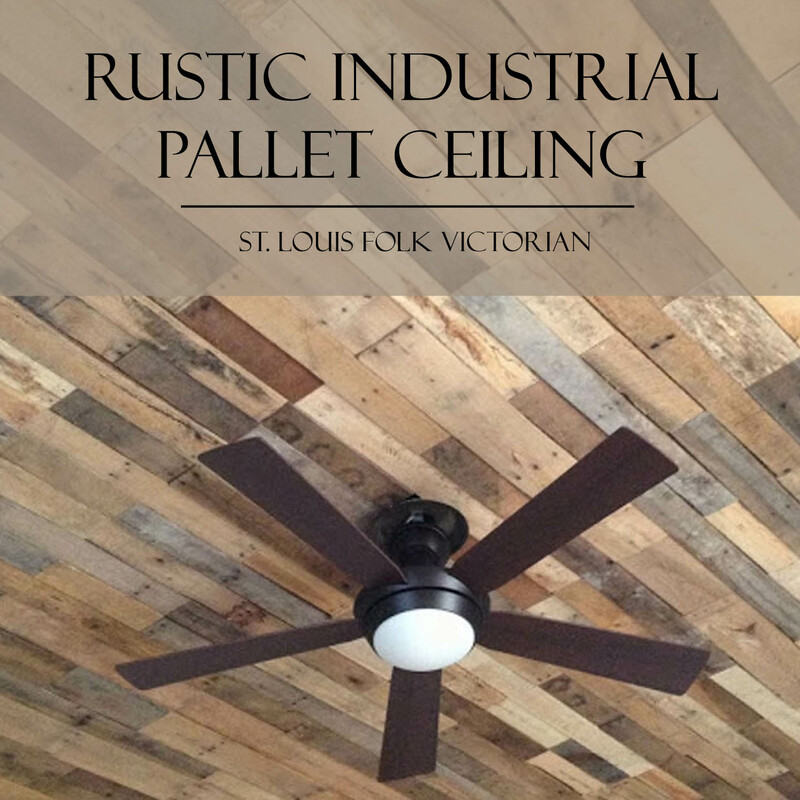 The rustic character of the ceiling is absolutely fantastic. And the pie plate coming to the rescue is a sheer genius. WOW - great ceiling! Very creative; cool look. 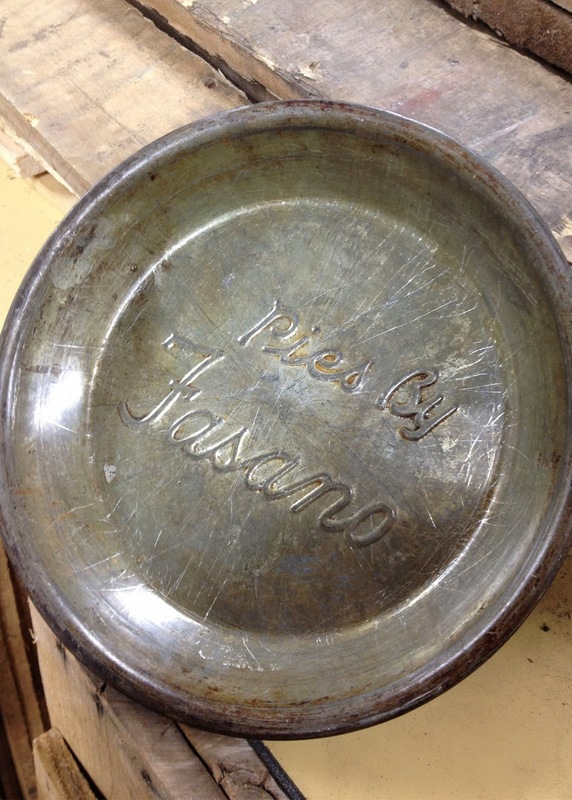 Clever use of the pie plate! It's like a gorgeous wooden quilt for your ceiling! One (rookie) question, though... Can I assume if you're using nails and not screws you have to drive everything in at an angle? Otherwise, what keeps Isaac Newton from pulling everything down eventually? I couldn't talk my husband into a ceiling other than drywall... until I showed him your picture. Thank You so much. I now have hope. This would be awesome for our basement ceiling.